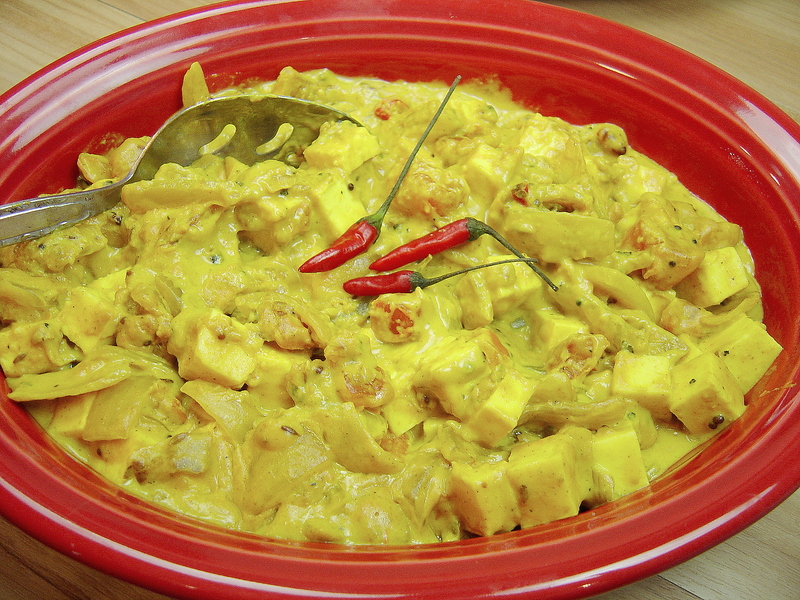 This is a curry made with paneer cheese, which is very meaty and a great vegetarian option. You can probably get away with using peanut butter instead of cashew butter, but I do recommend the cashew for the flavor. When I made this, I served it with bhindi masala curry and lemon rice, both some of my favorites! The bhindi makes a great entree as well, but I like to make a smaller amount and serve it with another type of curry, especially if that curry is light on vegetables. Heat oil in a skillet; add onion, cumin, mustard seed and curry leaves; cook for about a minute or until spices sputter. Add ginger and garlic paste to pan along with turmeric, coriander, asafoetida, salt and pepper, stirring to mix well. Add chopped tomatoes and chopped chillies and a half cup water and cook over low heat, stirring, until tomato breaks down, adding more water as needed. When tomatoes get soft and curry is still slightly saucy, stir in the cashew butter. Add a little water if it is too thick. Then stir in the cream and paneer cubes and simmer over low heat about 5 minutes or just until hot; do not boil.